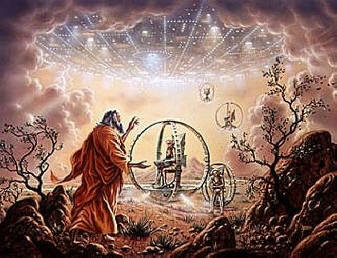 The Book of Enoch is an ancient Jewish religious work, ascribed to Enoch, the great-grandfather of Noah. It is not currently regarded as part of the Canon of Scripture as used by Jews, apart from the Beta Israel canon; nor by any Christian group, apart from the Ethiopian Orthodox Church canon. Western scholars currently assert that its older sections (mainly in the Book of the Watchers) date from about 300 BC and the latest part (Book of Parables) probably was composed at the end of the 1st century BC. However, Ethiopian scholars generally hold that Ge'ez is the language of the original from which the Greek and Aramaic copies were made, pointing out that it is the only language in which the complete text has yet been found. It is wholly extant only in the Ge'ez language, with Aramaic fragments from the Dead Sea Scrolls and a few Greek and Latin fragments. There is no consensus among Western scholars about the original language: some propose Aramaic, others Hebrew, while the probable thesis according to E. Isaac is that Enoch, as Daniel, was composed partially in Aramaic and partially in Hebrew. A short section of 1 Enoch (1En1:9) is quoted in the New Testament (Letter of Jude 1:14-15), and there apparently attributed to "Enoch the Seventh from Adam" (1En60:8). It is argued that all the writers of the New Testament were familiar with it and were influenced by it in thought and diction. The words of the blessing of Enoch, wherewith he blessed the elect and righteous, who will be living in the day of tribulation, when all the wicked and godless are to be removed. 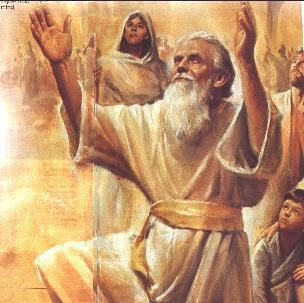 And he took up his parable and said --Enoch a righteous man, whose eyes were opened by God, saw the vision of the Holy One in the heavens, which the angels showed me, and from them I heard everything, and from them I understood as I saw, but not for this generation, but for a remote one which is for to come. Concerning the elect I said, and took up my parable concerning them: The Holy Great One will come forth from His dwelling, And the eternal God will tread upon the earth, (even) on Mount Sinai, [And appear from His camp] And appear in the strength of His might from the heaven of heavens. And all shall be smitten with fear And the Watchers shall quake, And great fear and trembling shall seize them unto the ends of the earth. VI-XI. The Fall of the Angels: the Demoralization of Mankind: the Intercession of the Angels on behalf of Mankind. The Dooms pronounced by God on the Angels of the Messianic Kingdom-- (a Noah fragment). And it came to pass when the children of men had multiplied that in those days were born unto them beautiful and comely daughters. And the angels, the children of the heaven, saw and lusted after them, and said to one another: 'Come, let us choose us wives from among the children of men and beget us children.' And Semjâzâ, who was their leader, said unto them: 'I fear ye will not indeed agree to do this deed, and I alone shall have to pay the penalty of a great sin.' And they all answered him and said: 'Let us all swear an oath, and all bind ourselves by mutual imprecations not to abandon this plan but to do this thing.' Then sware they all together and bound themselves by mutual imprecations upon it. And they were in all two hundred; who descended in the days of Jared on the summit of Mount Hermon, and they called it Mount Hermon, because they had sworn and bound themselves by mutual imprecations upon it. And these are the names of their leaders: Samîazâz, their leader, Arâkîba, Râmêêl, Kôkabîêl, Tâmîêl, Râmîêl, Dânêl, Êzêqêêl, Barâqîjâl, Asâêl, Armârôs, Batârêl, Anânêl, Zaqîêl, Samsâpêêl, Satarêl, Tûrêl, Jômjâêl, Sariêl. These are their chiefs of tens. And all the others together with them took unto themselves wives, and each chose for himself one, and they began to go in unto them and to defile themselves with them, and they taught them charms and enchantments, and the cutting of roots, and made them acquainted with plants. And they became pregnant, and they bare great giants, whose height was three thousand ells: Who consumed all the acquisitions of men. And when men could no longer sustain them, the giants turned against them and devoured mankind. And they began to sin against birds, and beasts, and reptiles, and fish, and to devour one another's flesh, and drink the blood. Then the earth laid accusation against the lawless ones. Then said the Most High, the Holy and Great One spake, and sent Uriel to the son of Lamech, and said to him: 'Go to Noah and tell him in my name "Hide thyself!" and reveal to him the end that is approaching: that the whole earth will be destroyed, and a deluge is about to come upon the whole earth, and will destroy all that is on it. And now instruct him that he may escape and his seed may be preserved for all the generations of the world.' And again the Lord said to Raphael: 'Bind Azâzêl hand and foot, and cast him into the darkness: and make an opening in the desert, which is in Dûdâêl, and cast him therein. And place upon him rough and jagged rocks, and cover him with darkness, and let him abide there for ever, and cover his face that he may 6,7 not see light. And on the day of the great judgement he shall be cast into the fire. And heal the earth which the angels have corrupted, and proclaim the healing of the earth, that they may heal the plague, and that all the children of men may not perish through all the secret things that the Watchers have disclosed and have taught their sons. And the whole earth has been corrupted through the works that were taught by Azâzêl: to him ascribe all sin.' And to Gabriel said the Lord: 'Proceed against the bastards and the reprobates, and against the children of fornication: and destroy [the children of fornication and] the children of the Watchers from amongst men [and cause them to go forth]: send them one against the other that they may destroy each other in battle: for length of days shall they not have. And no request that they (i.e. their fathers) make of thee shall be granted unto their fathers on their behalf; for they hope to live an eternal life, and that each one of them will live five hundred years.' And the Lord said unto Michael: 'Go, bind Semjâzâ and his associates who have united themselves with women so as to have defiled themselves with them in all their uncleanness. And when their sonshave slain one another, and they have seen the destruction of their beloved ones, bind them fast for seventy generations in the valleys of the earth, till the day of their judgement and of their consummation, till the judgement that is for ever and ever is consummated. In those days they shall be led off to the abyss of fire: and to the torment and the prison in which they shall be confined for ever. And whosoever shall be condemned and destroyed will from thenceforth be bound together with them to the end of all generations. And destroy all the spirits of the reprobate and the children of the Watchers, because they have wronged mankind. Destroy all wrong from the face of the earth and let every evil work come to an end: and let the plant of righteousness and truth appear: and it shall prove a blessing; the works of righteousness and truth' shall be planted in truth and joy for evermore. Shall they complete in peace. And then shall the whole earth be tilled in righteousness, and shall all be planted with trees and be full of blessing. And all desirable trees shall be planted on it, and they shall plant vines on it: and the vine which they plant thereon shall yield wine in abundance, and as for all the seed which is sown thereon each measure (of it) shall bear a thousand, and each measure of olives shall yield ten presses of oil. And cleanse thou the earth from all oppression, and from all unrighteousness, and from all sin, and from all godlessness: and all the uncleanness that is wrought upon the earth destroy from off the earth. And all the children of men shall become righteous, and all nations shall offer adoration and shall praise Me, and all shall worship Me. And the earth shall be cleansed from all defilement, and from all sin, and from all punishment, and from all torment, and I will never again send (them) upon it from generation to generation and for ever. XII-XVI. Dream-Vision of Enoch: his Intercession for Azâzêl and the Fallen Angels: and his Announcement of their first and final Doom. And Enoch went and said: 'Azâzêl, thou shalt have no peace: a severe sentence has gone forth against thee to put thee in bonds: And thou shalt not have toleration nor request granted to thee, because of the unrighteousness which thou hast taught, and because of all the works of godlessness and unrighteousness and sin which thou hast shown to men.' Then I went and spoke to them all together, and they were all afraid, and fear and trembling seized them. And they besought me to draw up a petition for them that they might find forgiveness, and to read their petition in the presence of the Lord of heaven. For from thenceforward they could not speak (with Him) nor lift up their eyes to heaven for shame of their sins for which they had been condemned. Then I wrote out their petition, and the prayer in regard to their spirits and their deeds individually and in regard to their requests that they should have forgiveness and length. And I went off and sat down at the waters of Dan, in the land of Dan, to the south of the west of Hermon: I read their petition till I fell asleep. And behold a dream came to me, and visions fell down upon me, and I saw visions of chastisement, and a voice came bidding (me) to tell it to the sons of heaven, and reprimand them. And when I awaked, I came unto them, and they were all sitting gathered together, weeping in 'Abelsjâîl, which is between Lebanon and Sênêsêr, with their faces covered. And I recounted before them all the visions which I had seen in sleep, and I began to speak the words of righteousness, and to reprimand the heavenly Watchers. The book of the words of righteousness, and of the reprimand of the eternal Watchers in accordance with the command of the Holy Great One in that vision. I saw in my sleep what I will now say with a tongue of flesh and with the breath of my mouth: which the Great One has given to men to converse therewith and understand with the heart. As He has created and given to man the power of understanding the word of wisdom, so hath He created me also and given me the power of reprimanding the Watchers, the children of heaven. I wrote out your petition, and in my vision it appeared thus, that your petition will not be granted unto you throughout all the days of eternity, and that judgement has been finally passed upon you: yea (your petition) will not be granted unto you. And from henceforth you shall not ascend into heaven unto all eternity, and in bonds of the earth the decree has gone forth to bind you for all the days of the world. And (that) previously you shall have seen the destruction of your beloved sons and ye shall have no pleasure in them, but they shall fall before you by the sword. And your petition on their behalf shall not be granted, nor yet on your own: even though you weep and pray and speak all the words contained in the writing which I have written. And the vision was shown to me thus: Behold, in the vision clouds invited me and a mist summoned me, and the course of the stars and the lightnings sped and hastened me, and the winds in the vision caused me to fly and lifted me upward, and bore me into heaven. And I went in till I drew nigh to a wall which is built of crystals and surrounded by tongues of fire: and it began to affright me. And I went into the tongues of fire and drew nigh to a large house which was built of crystals: and the walls of the house were like a tesselated floor (made) of crystals, and its groundwork was of crystal. Its ceiling was like the path of the stars and the lightnings, and between them were fiery cherubim, and their heaven was (clear as) water. A flaming fire surrounded the walls, and its portals blazed with fire. And I entered into that house, and it was hot as fire and cold as ice: there were no delights of life therein: fear covered me, and trembling gat hold upon me. And as I quaked and trembled, I fell upon my face. And I beheld a vision, And lo! there was a second house, greater than the former, and the entire portal stood open before me, and it was built of flames of fire. And in every respect it so excelled in splendour and magnificence and extent that I cannot describe to you its splendour and its extent. And its floor was of fire, and above it were lightnings and the path of the stars, and its ceiling also was flaming fire. And I looked and saw therein a lofty throne: its appearance was as crystal, and the wheels thereof as the shining sun, and there was the vision of cherubim. 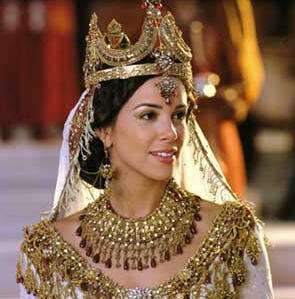 And from underneath the throne came streams of flaming fire so that I could not look thereon. And the Great Glory sat thereon, and His raiment shone more brightly than the sun and was whiter than any snow. None of the angels could enter and could behold His face by reason of the magnificence and glory and no flesh could behold Him. The flaming fire was round about Him, and a great fire stood before Him, and none around could draw nigh Him: ten thousand times ten thousand (stood) before Him, yet He needed no counselor. And the most holy ones who were nigh to Him did not leave by night nor depart from Him. And until then I had been prostrate on my face, trembling: and the Lord called me with His own mouth, and said to me: 'Come hither, Enoch, and hear my word.' And one of the holy ones came to me and waked me, and He made me rise up and approach the door: and I bowed my face downwards. And He answered and said to me, and I heard His voice: 'Fear not, Enoch, thou righteous man and scribe of righteousness: approach hither and hear my voice. And go, say to the Watchers of heaven, who have sent thee to intercede for them: "You should intercede" for men, and not men for you: Wherefore have ye left the high, holy, and eternal heaven, and lain with women, and defiled yourselves with the daughters of men and taken to yourselves wives, and done like the children of earth, and begotten giants (as your) sons? And though ye were holy, spiritual, living the eternal life, you have defiled yourselves with the blood of women, and have begotten (children) with the blood of flesh, and, as the children of men, have lusted after flesh and blood as those also do who die 5 and perish. Therefore have I given them wives also that they might impregnate them, and beget children by them, that thus nothing might be wanting to them on earth. But you were formerly spiritual, living the eternal life, and immortal for all generations of the world. And therefore I have not appointed wives for you; for as for the spiritual ones of the heaven, in heaven is their dwelling. 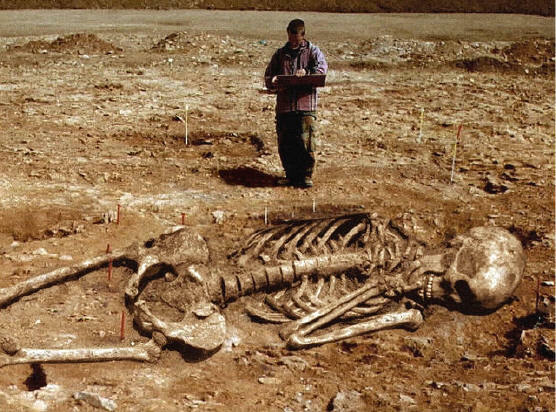 And now, the giants, who are produced from the spirits and flesh, shall be called evil spirits upon the earth, and on the earth shall be their dwelling. Evil spirits have proceeded from their bodies; because they are born from men and from the holy Watchers is their beginning and primal origin; they shall be evil spirits on earth, and evil spirits shall they be called. [As for the spirits of heaven, in heaven shall be their dwelling, but as for the spirits of the earth which were born upon the earth, on the earth shall be their dwelling.] And the spirits of the giants afflict, oppress, destroy, attack, do battle, and work destruction on the earth, and cause trouble: they take no food, but nevertheless hunger and thirst, and cause offences. And these spirits shall rise up against the children of men and against the women, because they have proceeded from them. XVII-XXXVI. Enoch's Journeys through the Earth and Sheol. And they took and brought me to a place in which those who were there were like flaming fire, and, when they wished, they appeared as men. And they brought me to the place of darkness, and to a mountain the point of whose summit reached to heaven. And I saw the places of the luminaries and the treasuries of the stars and of the thunder and in the uttermost depths, where were a fiery bow and arrows and their quiver, and a fiery sword and all the lightnings. And they took me to the living waters, and to the fire of the west, which receives every setting of the sun. And I came to a river of fire in which the fire flows like water and discharges itself into the great sea towards the west. I saw the great rivers and came to the great river and to the great darkness, and went to the place where no flesh walks. I saw the mountains of the darkness of winter and the place whence all the waters of the deep flow. I saw the mouths of all the rivers of the earth and the mouth of the deep. And Uriel said to me: 'Here shall stand the angels who have connected themselves with women, and their spirits assuming many different forms are defiling mankind and shall lead them astray into sacrificing to demons as gods, (here shall they stand,) till the day of the great judgement in which they shall be judged till they are made an end of. And the women also of the angels who went astray shall become sirens.' And I, Enoch, alone saw the vision, the ends of all things: and no man shall see as I have seen. 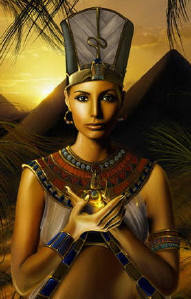 Did you ever wonder about the "sons of God" in the sixth chapter of Genesis? Well, it was a few lines summing up the book of Enoch, likely written prior to Genesis even. This book argues that Enoch is Scripture and also explains why that is so. But since as the cover reads the church fathers suppressed it, we don't find it in our Bibles today. But by drawing parallels to it and our Bible it concludes Jesus had thorough Enochian knowledge. Not only that, but that all the characters of biblical times knew of the Watchers' fall, and the adulteration of our race with Nephilim genetics. Did rebel angels take on human bodies to fulfill their lust for the "daughters of men"? Did these fallen angels teach men to build weapons of war? That is the premise of the Book of Enoch, a text cherished by the Essenes, early Jews and Christians but later condemned by both rabbis and Church Fathers. The book was denounced, banned and "lost" for over a thousand years-until in 1773, a Scottish explorer discovered three copies in Ethiopia. Elizabeth Clare Prophet examines the controversy surrounding this book and sheds new light on Enoch's forbidden mysteries. She demonstrates that Jesus and the apostles studied the Book of Enoch and tells why Church Fathers suppressed its teaching that angels could incarnate in human bodies. 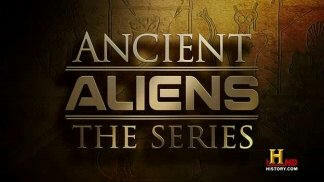 Contains all the Enoch texts, including the Book of Enoch, and biblical parallels. Fallen Angels and the Origins of Evil takes you back to the primordial drama of Good and Evil, when the first hint of corruption entered a pristine world-earth. Contains Richard Laurence's translation of the Book of Enoch, all the other Enoch texts, including the Book of the Secrets of Enoch, biblical parallels. Quoted in the book of Jude, and used to form our view of angels and demons, this book connects the dots of doctrine and prophecy in the scriptures. It goes into more detail about the "Sons of God (Angels) that left their positions in heaven to marry human women", having children that became giants and introducing violence, sorcery, and evil spirits into the world. A Mayan Priest Reveals What the 2012 Prophecy Really Means for Your Life. Written at the request of the Mayan Elders, by a member of the Guatemalan Elders Council and Mayan priest Carlos Barrios, The Book of Destiny is a tool to help people understand their life purpose and to use this profound knowledge to make the best of their time on earth. Discover attracts intelligent and curious readers - forward thinkers and public advocates engaging in a dialogue of action that influences opinion leaders and encourages innovation. They are active in their communities, carry a strong voice concerning political issues and are very active in environmental groups. It present science in a very exciting and approachable way. Stories are typically accompanied with many large photos or illustrations. It is typically packed with stories that cover a wide range of science from archeology to space travel. This magazine is designed for technically educated professionals and managers interested in a broad range of the physical and social sciences. Its articles and features anticipate what the breakthroughs and the news will be in a society increasingly dependent upon scientific and technological advances. NATIONAL GEOGRAPHIC, the flagship magazine of the National Geographic Society, chronicles exploration and adventure, as well as changes that impact life on Earth. Editorial coverage encompasses people and places of the world, with an emphasis on human involvement in a changing universe. Major topics include culture, nature, geography, ecology, science and technology. Popular Mechanics is for people who have a passion to know how things work. It's about how the latest advances in science and technology will impact your home, your car, consumer electronics, computers, even your health. Popular Mechanics - answers for curious minds. This magazine chronicles the arts, environment, sciences and popular culture of the times. It is edited for modern, well-rounded individuals with diverse, general interests. Each subscription includes a membership to the Smithsonian Institution which provides special discounts at Smithsonian gift shops, world travel opportunities through Smithsonian study tours and information on all Smithsonian events in any area. Articles cover all areas of science and endeavor to provide explanations of research. This bimonthly magazine contains science articles written by scientists for the scientifically literate reader (primarily other scientists). 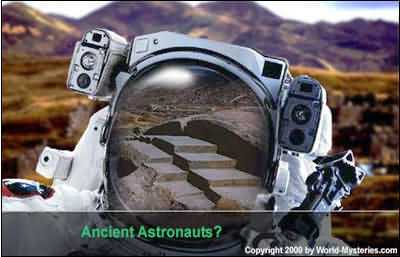 www.antiguosastronautas.com (in Spanish language) presents the Ancient Astronaut hypothesis. Several articles (translated from English into Spanish) by Erich von Däniken, Ulrich Dopatka, Johannes Fiebag and Peter Fiebag, Vladimir Rubtsov, George Sassoon, Zecharia Sitchin, and many others authoritative researchers in this field.